PSNews – The Provincial Police, Border Guard and Customs agencies and authorities of the border localities of Ha Tinh on April 15 agreed to launch an intensive campaign to suppress drug-related crimes in Vietnamese areas along the Vietnam-Laos borderline. PSNews - The Ministry of Public Security (MPS) on April 16 organized the opening ceremony of the book exhibition “Public Security Forces follow Uncle Ho’s teachings” to introduce various books and authors, and launch a reading movement within the Public Security Forces. PSNews – Tens of thousands of people have flocked to Hung Kings Temple on April 14 to join the National Death Anniversary of Hung Kings. Thanks to good detailed plans, the Public Security Forces have ensured absolutely security and order during the Festival. 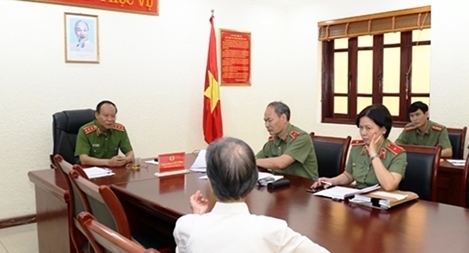 PSNews –General To Lam, Politburo Member and Minister of Public Security, on April 11 had a meeting in Can Tho City with retired high-ranking public security officers in South-western localities and Tay Ninh province, on the occasion of the 44th Anniversary of the National Reunification (April 30, 1975 – 2019). PSNews - The Women's Union chapter of the Tuyen Quang Municipal Police Department on April 9 offered 300 free porridge meals to poor patients treated at the Tuyen Quang Provincial General Hospital. PSNews - Within the framework of the ceremony to celebrate the 45th Traditional Day of the Mobile Police Force (April 15, 1974- 2019) and receive the First-class Military Exploit Order, the Mobile Police Command on April 10 also conducted a parade with the participation of its units and vehicles. PSNews - General To Lam, Politburo Member, Minister of Public Security, attended and delivered a keynote speech at the conference of the Police Investigation Agency under the Ministry of Public Security (MPS), on April 4. The meeting reviewed the investigation police force’s task performance in Q1. PSNews – The Investigation Police Department on Drug-related Crimes under the Ministry of Public Security and the Drug and Crime Control Department under the Command of Border Guard, Ministry of Defence, on April 9 signed a coordination agreement in preventing and fighting drug-related crimes. PSNews - Senior Colonel Le Tan Toi, Director of the Bac Lieu Provincial Police Department, on April 9 led a delegation to visit religious dignitaries in the province on the occasion of the Khmer people’s Chol Chnam Thmay festival. 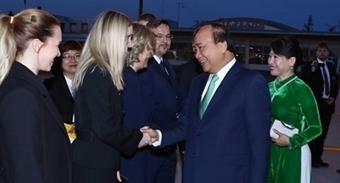 PSNews – Senior Lieutenant General Nguyen Van Thanh, Deputy Minister of Public Security on April 4 and 5 worked with Thai partners to discuss bilateral cooperation in combating transnational crimes; visited and worked with the police of Chiangrai province, part of the Golden Triangle. PSNews - The Tan Son Nhat International Airport Customs Sub-department under the Ho Chi Minh City Customs Department and the Economic Police Division under the Ho Chi Minh Municipal Police Department held a meeting on April 9 to draft coordination regulations for fighting against transnational economic crimes. PSNews - The Traffic Police Division under the Hanoi Municipal Police Department on April 8 held a training program on traffic law and traffic safety for students of To Hoang Secondary School and Quan Hoa Primary School. PSNews - The Ministry of Public Security (MPS) held a video conference on April 8 to roll out the Law on Special Amnesty. The Department of Legal Affairs and Administrative, Judicial Reforms under the Ministry of Public Security (MPS) on April 8,in coordination with the People’s Security Academy and the Clingendael Institute(the Netherlands), organized a training course on The Convention against Torture and Other Cruel, Inhuman or Degrading Treatment or Punishment (UNCAT). PSNews - A Vietnamese Ministry of Public Security delegation, led by Deputy Minister, Senior Lieutenant General Nguyen Van Thanh reaffirmed its commitment to prevent and combat transnational crimes at the Synchronizing Trade and Security Plans in Support of ASEAN 2025 conference in Bangkok, Thailand. PSNews - Captain Giang Hoang Thien and Lieutenant Tran Van Luong of the Traffic Police Division under the Ho Chi Minh Municipal Police Department were honored for uncovering the illegal transportation of more than 300kg of heroin on March 27. PSNews – General To Lam, Minister of Public Security, on April 4 issued a Public Document to order all police units to make more efforts to detect, investigate, handle and curb crimes and law violations, particularly violence and sexual abuse cases related to children, in a timely and effective.